Heat exchangers on board of ships are exposed to a corrosive ambient. Often the seawater is polluted and the heat exchangers have often to be opened and cleaned. Our FH (Evaporators) and NK (Condensers) series fullfills all demands for such applications, they are easy to clean and very resistant to corrosion. We also offer vertical Condensers within our NKV Series. Coated heads are vulnerable to damages. Often the coating is damaged during cleaning or due to polluted seawater. Only small defects lead to corrosion and defects. Our PE-HD heads have not be coated and are therefore resistant to corrosion even if the surface is damaged. Heads can also be manufactured of Titanium, but such solution is much more expensive then PE-HD heads. PE-HD less heavy then compareable steel heads which is a advantage if the heads have to be removed for cleaning purposes. The titanium tubes are welded to the tubessheet and therefor resistant to leaks. In some cases the seawater has to be in the shell. In such cases we produce the shell out of PE-HD. 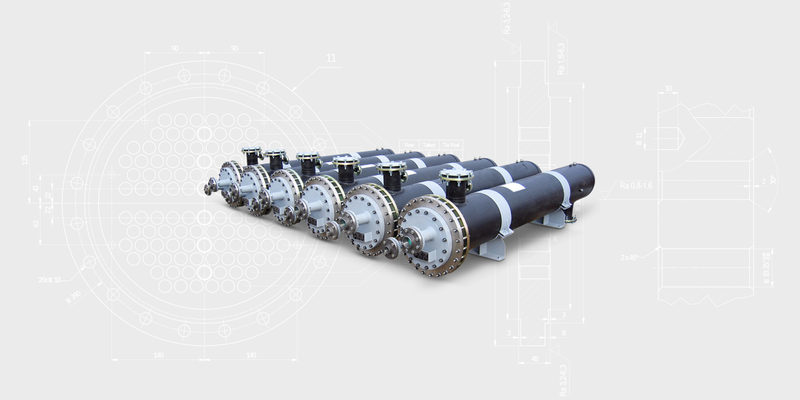 All Marine Heat exchangers can be delivered with DNV, GL, PED or similar approvals.